Two astronauts await recovery after completing the Gemini VIII mission in 1966. 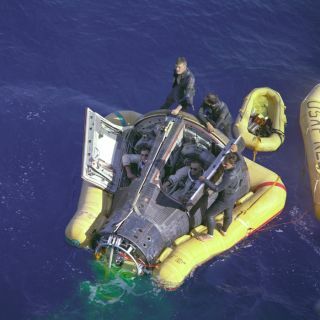 In this historical photo from the U.S. space agency, Astronauts Neil A. Armstrong and David R. Scott sit with their spacecraft hatches open while awaiting the arrival of the recovery ship, the USS Leonard F. Mason after the successful completion of their Gemini VIII mission. They are assisted by USAF Pararescuemen Eldrige M. Neal, Larry D. Huyett, and Glenn M. Moore. The overhead view shows the Gemini 8 spacecraft with the yellow flotation collar attached to stabilize the spacecraft in choppy seas. The green marker dye is highly visible from the air and is used as a locating aid.